It was not until the 19th century that scientific -- and entrepreneurial -- innovation began to change the world of oil. Within 11 of years of the first oil well in the United States, John D. Rockefeller founded Standard Oil. 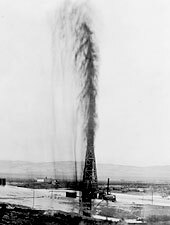 The following years saw an oil boom in the American West, the mass-production of the automobile, and other technological developments that created an explosion of oil excavation, distribution, and use. Workers shovel out refuse from the hot pools of oil that comes up from a spouting well. Benjamin Silliman's "Report on Rock Oil, or Petroleum, from Venango County, Pennsylvania" indicates the wide range of useful products that could be made from petroleum. Silliman's report lends credence to the idea that oil could be a profitable commodity. American entrepreneur George Bissel's Pennsylvania Rock Oil Company of New York contracts "Colonel" Edwin L. Drake to drill for oil near a well-known oil seep on Oil Creek in Titusville, Pennsylvania. On August 27, Drake strikes oil at a depth of 70 feet (21 meters). This was the first oil well in the United States, and is often cited as a key moment in the birth of the commercial era of petroleum. John D. Rockefeller founds Standard Oil of Ohio, the largest corporation in the country, with $1 million in capital. By 1878 Standard Oil will be responsible for roughly 90 percent of the refining capacity in the U.S. The world's first oil tanker, the steam-powered Zoroaster, is built by the Nobel brothers to transport kerosene in the Caspian. Gushers like this one were common, particularly in the early days of oil harvesting. Thomas Edison invents the incandescent light bulb. Edison's invention will eventually make the kerosene lamp obsolete and put a damper on the volatile liquid's commercial flame. The oil industry enters a recession. The first known offshore oil well is drilled at the end of a 300-foot wharf in Summerland, California. On January 10, Spindletop, an oil field located just south of Beaumont, Texas, produces a "gusher" that spills out 100,000 barrels of oil per day. Spindletop would soon turn Beaumont into one of the U.S.'s first oil-fueled boomtowns, heralding the era of big-time oil speculation in Texas. The Model "T" made the automobile accessible on a previously unprecedented scale. Entrepreneur Henry Ford incorporates the Ford Motor Company. Introduced in 1908, Ford's mass-produced Model T will make the automobile accessible to many Americans and drive consumer demand for gasoline, a previously little used byproduct of the petroleum refining process. Standard Oil is ordered to be broken up into 34 smaller companies after the United States Supreme Court declares the company an "unreasonable" monopoly under the Sherman Antitrust Act. During World War I, strategists for all the major powers increasingly perceive oil as a key military asset due to the adoption of oil-powered naval ships, new horseless army vehicles such as trucks and tanks, and even military airplanes. Use of oil during the war increases so rapidly that a severe shortage developed in 1917-18.